Having driven said beast myself, I'm officially well jel. Is that a Belling 90BI double oven? They're nice they are. 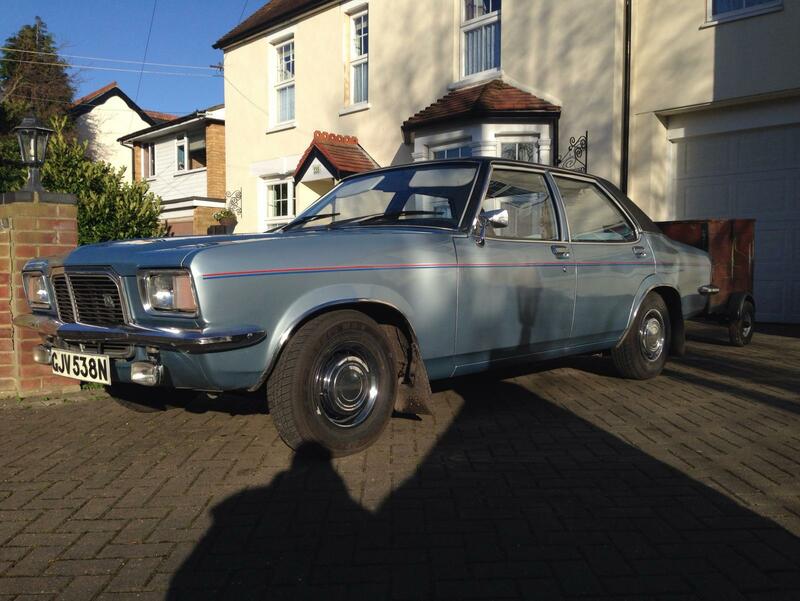 Yes, it's AngryDicky's gorgeous Vauxhall not-Victor 2300S. I can officially agree with everyone who has said that it looks and goes every bit as well in real life as it looks in the pictures. The cute trailer (borrowed) has an overdrive gearbox in it, by the way. This is a class motor. Limited phone battery but I'll do a progress update in a bit: I'm about to hit the M25. Well done Skizzer,a top buy. Nice one, Martin, that's one hell of a car you've got yourself. Now I'm seriously jealous, well bought! I so want to be you Martin. Winner, that's lovely. I could'nt bring myself to use that in the winter salt we have up here. Well bought. Seriously bloody nice car - I would rather have that than Jenny Agutter. Nice one! That's a lovely car and I'm glad it's staying with someone on here too. You got lucky with the weather too, nicer today than it has been lately. TORQUE! Endless amounts of shove, can't believe it's only got four cylinders. Seriously - accelerate from 50 to pass trucks on the motorway, in top gear, up a hill? With a spare gearbox in a trailer? No problem at all. It's so torquey I forgot it was a manual and almost stalled it when I parked up earlier. Seats are very comfy yet supportive. 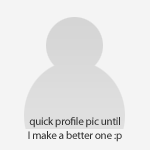 (Ask me again in about 5 hours though.) Ride is good although it crashes around a bit on potholes and broken concrete motorway. The driving position is good but quirky: the big steering wheel threatens to clash with my legs but somehow never quite does; the pedals are slightly offset to the right but it doesn't seem to matter. Steering is very good - precise and nicely weighted. I haven't exactly been chucking it around, but it feels right. It's not the quietest car ever, with a fair amount of rumble and road roar, some of which is down to the trailer, but it's perfectly acceptable at up to 60mph. I haven't been any faster because that's the limit when towing, besides which the trailer is a bit ancient and not mine. Anyway it's quite enough. I love the interior. It's so light and airy, and so BLUE. Such great condition too - cared-for rather than restored. The car is a great tribute to AngryDicky's skills and efforts to iron out the niggles it had when he bought it. I will try to continue to care for it like he and previous owners clearly have: I do rather feel the weight of this responsibility. It was great to meet Dicky (who wasn't at all angry) and EssDeeWon, plus beige Maestro and primrose 75 which are both very fine vehicles too. And thanks to AngryFather for the cup of very welcome tea. Happy. Right, onwards and homewards. One thing i will say is be grateful your in the front and not the back, it does suffer from a lot of engine drone from the back which you surprisingly don't notice in the front. I still love the car though. Glad it's staying within the confines of AS. That slant 4 is very torquey indeed. No picturs of Ms Agutter with her cans out? 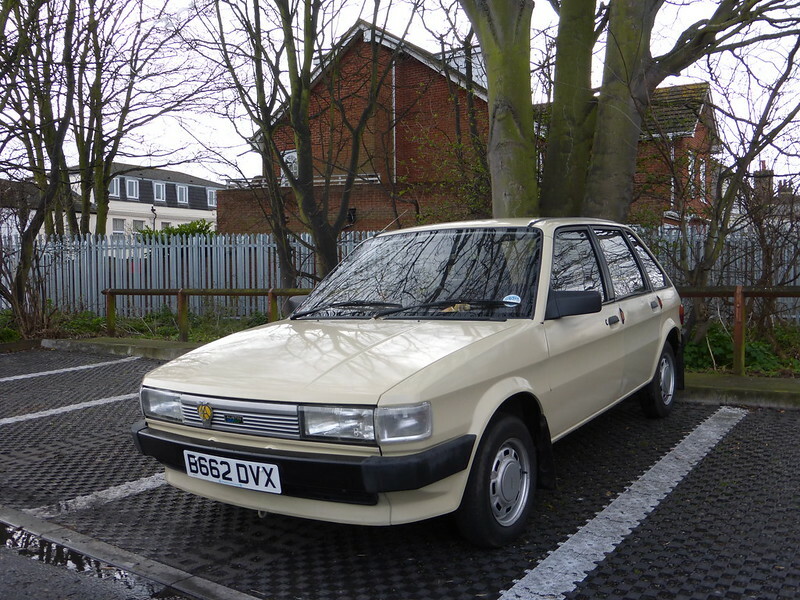 Good to meet you today Martin, and I finally got a proper look at Dicky's beige Maestro which really does define Autoshite. Awesome car, and gone to the right home too. I'm sure Skizzer will looks after it well. Hopefully Mrs Skizz will like it too! Skiz, your fleet of shite is rapidly approaching epicness. It's almost enough to make up for the you-know what. Whad da actual fucque? This is super awesome! Having a quick burger break at Leigh Delamere. I am so respectful of the car that I'm not eating my burger in it. You're not wrong about the drone. NVH standards were a bit different in the 1970s, I think; shame because wind noise and otherwise even engine noise are not too bad. Hey-ho. She has pre-approved it in principle from the photos. Fingers crossed. Ta. I was contemplating swinging by Breadvan Towers on the way home (I'd have checked you were in first), but then I realised it was going to take many hours even the dull-but-direct way so I'm afraid I bailed. Also, trailer - I haz TEH FEAR of reversing back out of driveways. It's almost enough to make up for the you-know what. Almost but not quite! We were talking about that this morning - I offered to fling myself under the wheels of EssDeeWon's lovely primrose 75 in ritual atonement for having caused the demise of its older brother though failure to clean out the plenum drains regularly enough. I still feel very bad, especially as it was an early-ish Cowley car. My driveway is so mega huge that you can turn around with a trailer in it, but I was doing a megaleptonned school run to Holt, Norfolk, and back (6 hours there and back in the free Bimmer, which can go over [censored on Fifth Amendment grounds] mph, er, allegedly). Happy burger noms and safe home. Loving the sound of the torquey engine, what a lovely old machine. What makes you think it'll take that long? Anyway, isn't it officially the "weekend" now? We may have to re-establish relations with MrsR's sister (who lives at St Athan) just so I can come and see your fleet, Skizz! 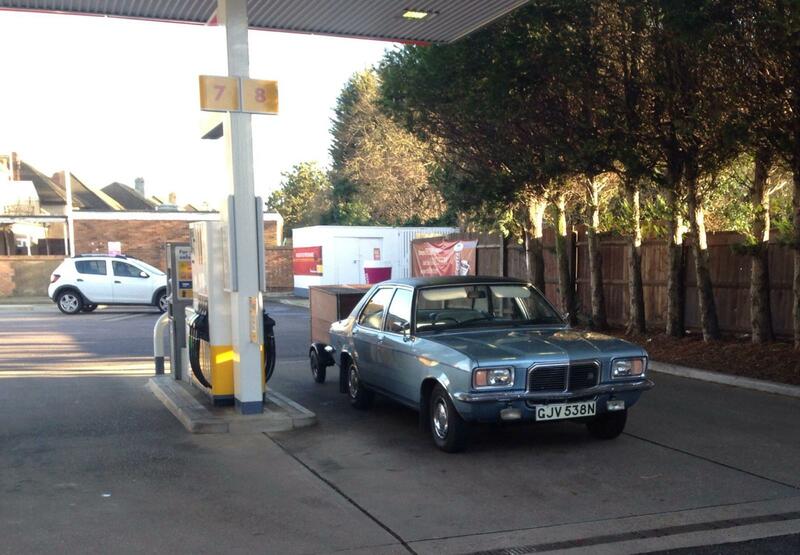 The other car Skizzer has ridden in today - Here is Dicky's Maestro waiting at Shoeburyness station at lunchtime for the final hurdle. Great news! 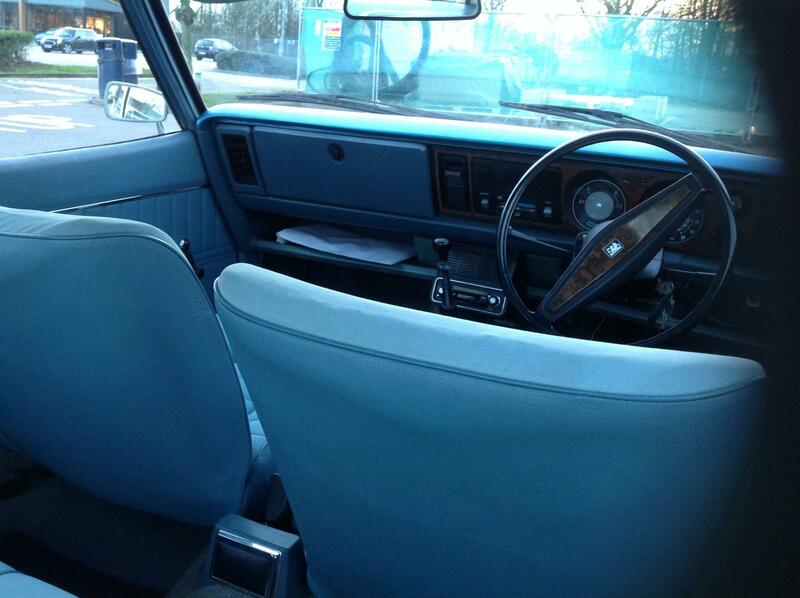 The torquey feel of the engine and that fantastic interior were what struck me about it.